Study/Reference Library at your fingertips. Great for Instructors or Students!! This multi-course 9th kyu to Godan/Teacher Training is for those that want to have TOTAL CONTROL over their OWN training and ACCELERATE their learning curve. Study Anytime! - Study Anywhere! Instant Access! Save Money! No Shipping Fees! No Vat Fees! 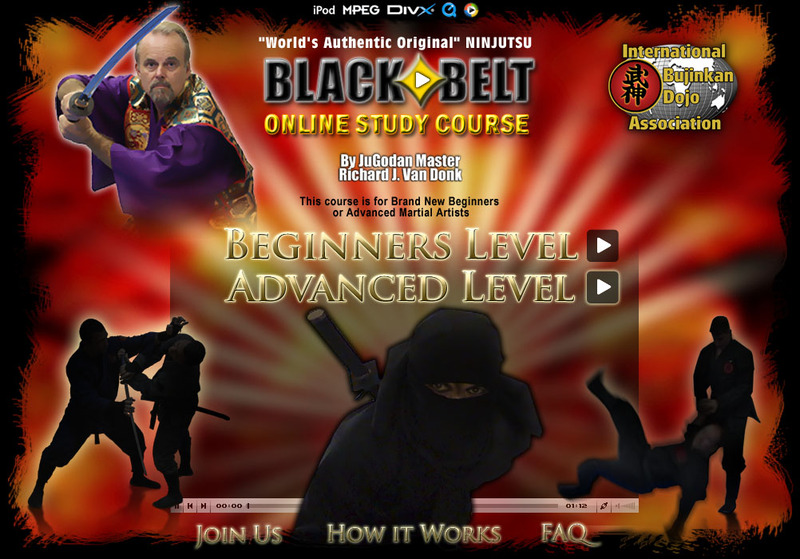 The Entire University level IBDA Bujinkan Ninjutsu_Budo Taijutsu Masters Course (as shown in the Physical Course image below) Plus so much, much more being added all the time is already waiting for you in the ONLINE NinjaDojo Portal Training. SEVERAL OPTIONS - SOMETHING FOR EVERY BUDGET. Time delivered study OR Complete Access from day one. where you get complete access to over 15 years of study with the, all from day one. Save so much money with the Online Version. SUPPORT - Everything is working perfectly... but computers are well computers. Overcoming Login Issues: Refresh your browser go to Login page by clicking the Members Link above. In the User box... Make sure that you are using the same e-mail address that you signed up with as all is coded to that e-mail address and enter your password correctly... no extra spaces or dots. If that does not work - Try creating a new password using the feature below the log in. Note: you can always change it back. If this does not work - try a different device as a test. Still not accessing check to see if your payment has been made. You will receive an reminder e-mail if this happens. Our system is never down for more that a couple minutes, if ever and these are the ONLY reasons we have ever had for not being able to log in. We are here to help!! For any other support issues - Please text 707-987-9322 with your name and email address used in the NinjaDojo Portal and briefly describe your challenge or e-mail us at info@bushindo.com. ENJOY THE UNLIMITED NINJA DOJO TEACHINGS! !